It’s been a while now since I’ve been using various Pure grips. I’ve used them as replacement grips, as grips on new clubs, and with various installation methods and tape variations. The end result of this experimentation is that I’ve come to the conclusion that Pure will be my grip of choice going forward. Grips are one of those things that seem so minor – but the reality is that they’re the point where you meet your clubs. While they may seem like a minor decision, being happy with your grips can have a huge impact on your game – particularly on your overall enjoyment of how it feels to play with your choice of clubs. 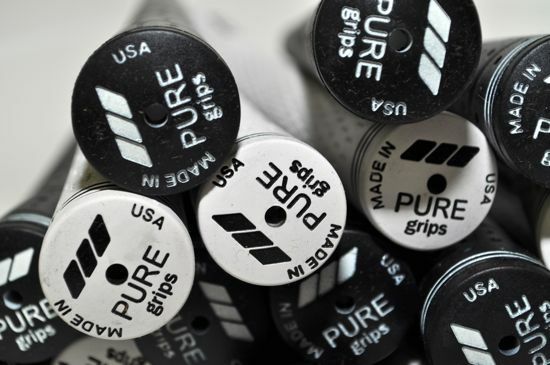 Pure has a great variety of grips and they all come in a diverse selection of colors. I’ve landed on the Pure Pro as my grip of choice since they seem to offer the perfect combination of both performance, feel, and style. Despite putting these grips to the test over a long period of time, they just don’t seem to ever wear out. I play a lot of golf and after six months I haven’t seen any noticeable wear on any of the grips that I’ve used. I’ve replaced all of my grips on my go-to clubs and after round-after-round and a variety of conditions they’re all still going strong. My introduction and interest in Pure came when I saw the Tapeless Installation technique demonstrated at the PGA show. 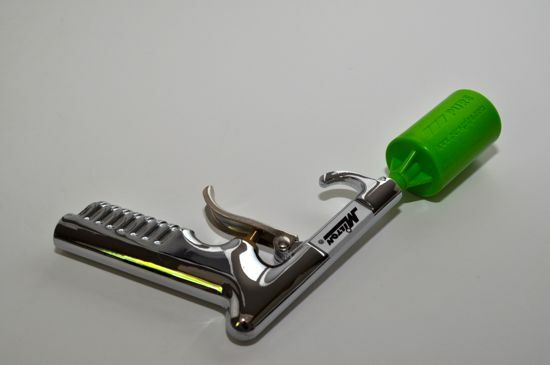 I played with the demo setup for quite a bit and was amazed at the ability to easily install and remove the grips with the quick-connection tool and an air compressor. It really is a great alternative to tradition gripping techniques and can give quite a bit of flexibility in swapping out your grips whenever you’re simply in the mood for something different (either in feel or style). All you need is the quick-connection tool, some pure grips, and an air compressor. Although the air-based system is impressive, I have to say that I was extremely perplexed trying to find a compatible air compressor that I could use to install and remove the grips. I went to a variety of hardware stores to check out alternatives and at the end of the day I simply gave up and ended up installing the grips the normal (messy and old-school) way. I’m simply not much of a handy man and while I would love the flexibility of removing and swapping out grips frequently, I don’t have the patience to research air compressors – it’s just not something that I ended up having the skills, knowledge, or patience for. Regardless – my time using the demo setup made me a believer in the method. 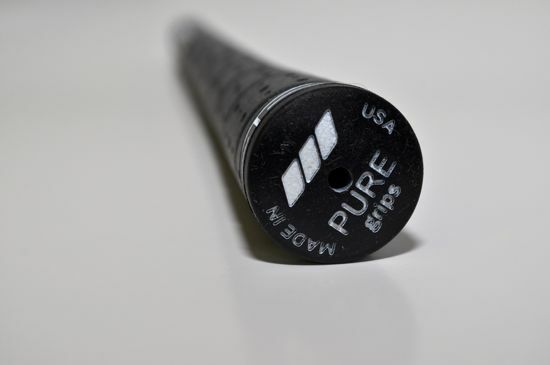 If you have the least bit of DIYer in you, this is a great option and differentiator of the Pure grips. Installing the grips the old-fashioned way worked just fine. I rarely do my own grips, but the Pure grips were an easy and straightforward installation. My first clubs that I re-gripped took about an hour and if you re-grip your clubs frequently then this will probably be a bit faster. 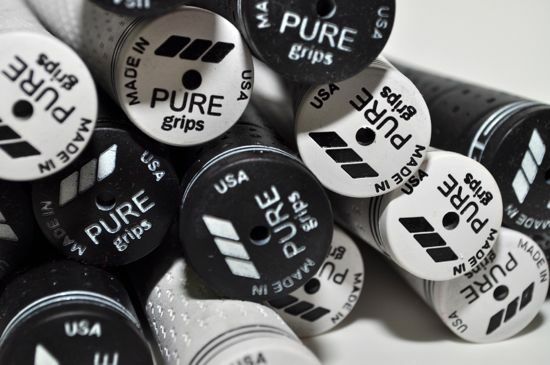 Since I frequently have new clubs come in for review, I’ve simply started requesting the Pure grips when they’re available. The durability and styling of the grips is excellent. I’ve played with the grips in rain and I can say that they outperform any other grip that I’ve ever used. Playing in the rain is challenging and having the Pure grips makes it quite a bit easier. Having the great color options results in the ability to mix things up quite a bit when building out your set or doing a full re-grip on your bag of clubs. I’ve started to really enjoy alternating the colors on my irons. There are plenty of time when I’ll just grab my even or odd numbered clubs and having the color combination of the clubs allows me to grab my black-gripped or white-gripped clubs (which usually depends on the course). In the cases when I take all of my clubs, the alternating colors just make for a simple visual distinction that allows giving my clubs a unique look and adds a bit of subdued variety to my bag. 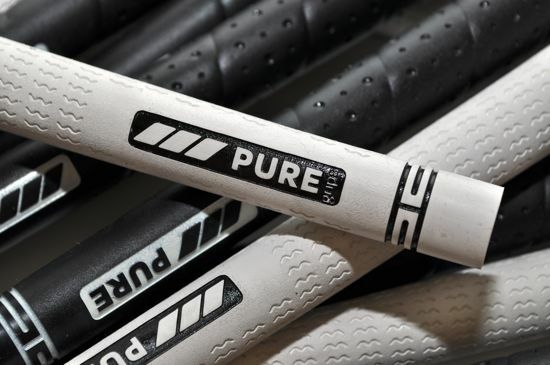 Regardless of the grip style that you’re looking for, Pure probably has you covered. The grips are excellent in all conditions, have great durability (I’ve yet to see a set of the grips weather), and provide some interesting color combination possibilities. If you’re interested in learning more about Pure, you can check out their website. 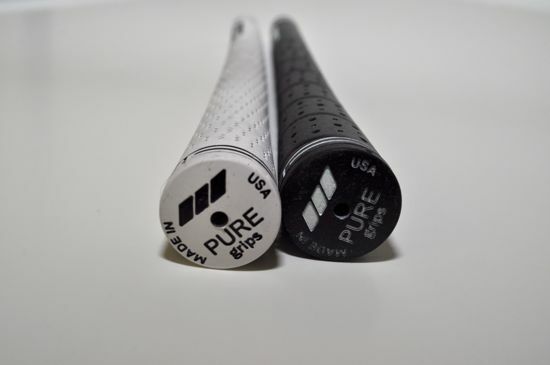 If you’d like to see some more pictures of the grips that were used for this review, you can check out our Pure Grips photo album on Facebook.